Ruskin Bond’s stories warm and fuzzy. They are the kind of stories that are meant to snuggle you in bed and put you to sleep – once again dreaming of them. He is a master of his craft and every time I think I need to go back to the familiar, I can depend on his stories. “The Black Dog” was a story I read yesterday as part of my 365 stories of 2017 and I thoroughly enjoyed it. It is about Bond and his experience with a black dog as he travels one night to attend a party in the 70s in Mussoorie where he resides. The story is scenic (as it should be) and you will not get bored even once. It is short and to the point and will leave you wanting more. The story is from the collection “Death under the Deodars”. I still have to read the others and will soon get to them. This entry was posted in 2017 Reads, 365 Short Stories, Books, January 2017 Reads, January 2017 Short Stories, Penguin Viking, Review, ruskin bond, short stories and tagged 2017 short stories, 365 short stories, day 6, January 2017 Reads, penguin viking, ruskin bond, The Black Dog on January 7, 2017 by thehungryreader. Disasters. What do they take in their wake? When they happen, and when they are done ruining what they have to. What really goes away from people? Maybe from communities at large. Sometimes from villages, hamlets, small cities and countries. Every time I think about the Bhopal Gas Tragedy, a piece of me goes out to the silent sufferers. It is the single most tragic event of the nation, which has been forgotten so easily. I got started thinking about this, just as I finished, one of the most empathic books I have read this year – “All That Is Solid Melts into Air” by Darragh McKeon – about the Chernobyl Power Plant and the collapse of the Soviet Union. “All That Is Solid Melts into Air” takes into account lives of people – when the incident occurred in 1986. It stays true to the disaster, but does that with the human element involved, which is what I loved about the book. It was not just another “account” of the tragedy. I am glad that I read this book. I am also saddened by it, but then I know that this will only make me want to read more about the accident. It is 1986. The world is going by just as it should. The Soviet Government controls every part of its citizens’ lives. Everything is monitored. Nothing or no one is left alone. In a run-down apartment block in Moscow, a nine-year old piano prodigy plays along silently, because he does not want to disturb the neighbours. His aunt on the other hand makes car parts on the outskirts of the city, and trying to hide her past at the same time. A surgeon buries himself in the hospital to run away from his failing marriage. And in a rural village in Ukraine, a teenager wakes up to see the sky, the shade of deepest crimson and blood dripping from his cattle’s ears. As all of this happens, ten miles away, at the Chernobyl Power Plant, something unbelievable is taking place. This in short is the plot of the book. These lives are about to change and they do not even know it. The title of the book comes from the Communist Manifesto and that should say it all, shouldn’t it? The way the book is written is simply stupendous. There is no way you will go away from the book without reflecting on what happened and what perhaps is still happening in the wake of the event. The book conveys the horrors without sugar-coating anything. McKeon’s writing is raw and bloody and there is no getting away from it. 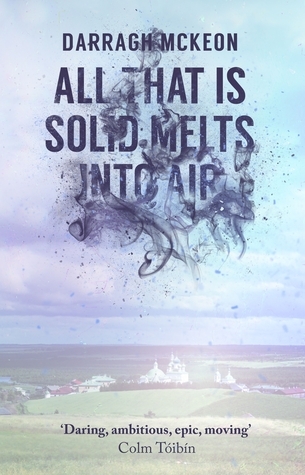 “All That Is Solid Melts into Air” is a book which you should not miss out reading. There is human kindness in these pages. There is sadness. There are circumstances that one cannot do much about. There is hope as well. There is also the knowing that when tragedy will strike, the possibility of humans sticking together is very high, no matter what one might think. This entry was posted in Books, Literary Fiction, Penguin Viking, Review and tagged All That Is Solid Melts into Air, Chernobyl Power Plant, Darragh McKeon, penguin viking on April 17, 2014 by thehungryreader.